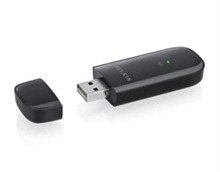 This wireless USB adapter features Wireless-N support for data transfer rates up to 300 Mbps and push-button security that is easy to set up. Complies with 802.11n standards, Backward compatible with 802.11a/b/g. Up to 300 Mbps data transfer rates, For a fast Internet connection. WPS push-button security, To keep your information secure. Connects directly to a USB port, For easy installation.